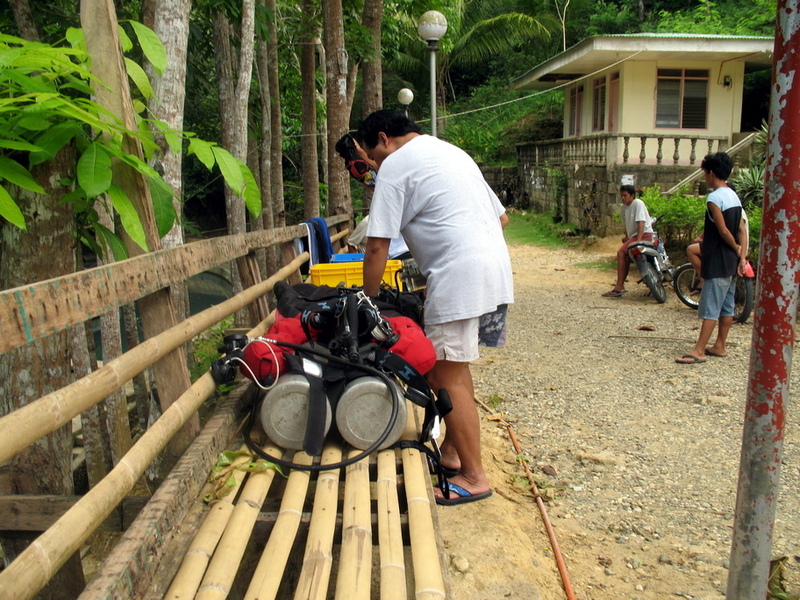 July 30, 2014 July 31, 2014 filipinocavedivers Cool Stuff! 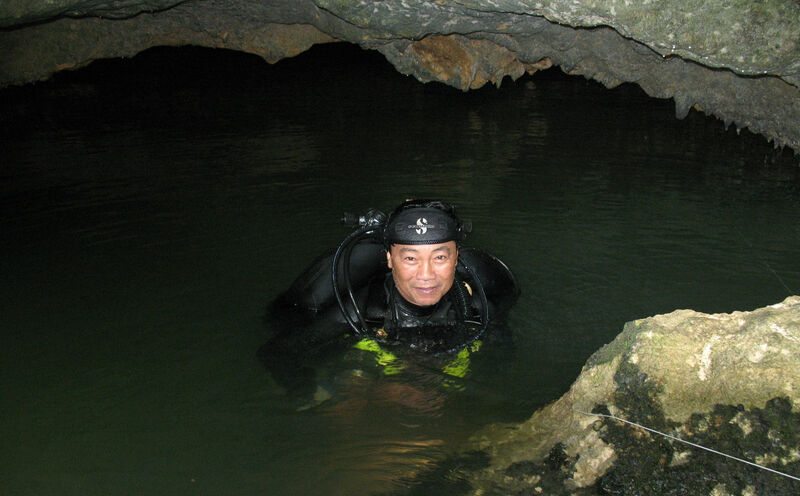 This article originally appeared in the “Chronicles of a Filipino Cave Diver” blog. Hon. Erico B. Aumentado, Provincial Governor; Atty. Tomas B. Abapo, Jr., Provincial Administrator; and Mr. Guido Valleser, a senior officer at the Bureau of Fisheries, Provincial Agriculture Office. The Municipality of Antequera was particularly heavily involved through Hon. Cecil Rebosora, Mayor, and her trusted brother Police Officer Maximo “Boy” Rebosora. We hit the town of Anda, 90 kms from Tagbilaran for our Exploration Day 1. This was the first working day of the newly elected officials, so we had to rely on the private sector to guide us to the exploration sites. We could not have found a better man to this than “Col.” Cipriano Bernido (actually a retired Army General), the well-respected elder statesman of the town. The first spring we went to was Tigdao. This got our hearts racing right off the bat since the place looks similar to our Pawod underwater cave in Mactan Island. Bernil did the initial swim-around exploration down to a maximum depth of 8 meters at a blind cul-de-sac. We then proceeded to the Kabagno spring, a very interesting place indeed. Firstly, cliffs all around fringe it, with the water surface a good 5 meters vertical from the cliff’s edge. Exit problems became apparent very soon since the ladder was removed by the owner the day before we came, not in anticipation of our coming but to put and end to the illegal harvesting of his coconuts by people swimming in the hole. We tried knotted ropes for clambering up. On a trial, this was successfully negotiated by Bernil…barely. We finally sent somebody out to get us a bamboo ladder. The underwater site in this area was nothing short of amazing – clear waters pierced by dancing sunrays. This is a truly amazing site indeed! No significant tunnel penetrations in this area, but what a place for confined open water instructional dives. Still in the same general area of Anda is Banilad spring. The area has long been converted into sort of a place of worship. 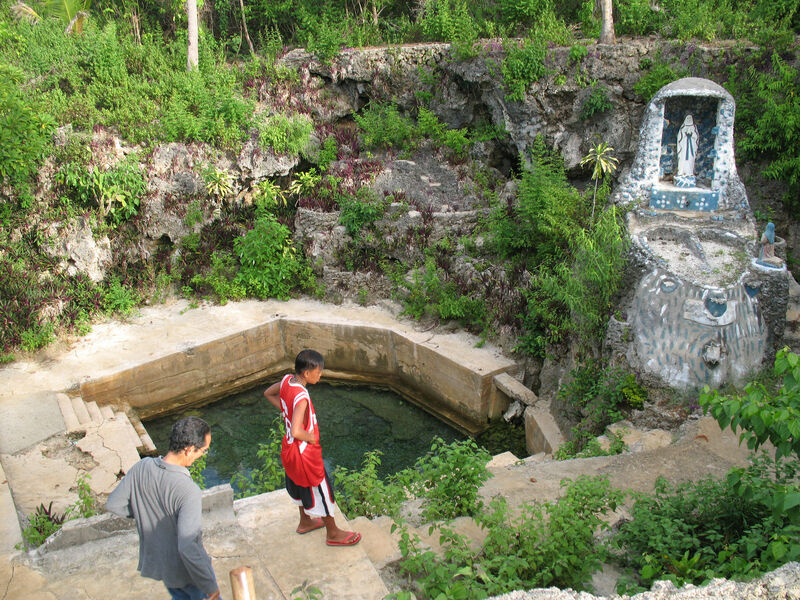 A grotto with a statue of the Blessed Virgin serves as the center of attraction. Because of the extensive modification, only a small natural cave is left. This leads to a tight space with a small pond of cool and crystal clear water. An underwater tunnel exists but it appears significantly constricted. We wonder how beautiful this place must have been before its conversion into a place of worship. Kalorenzo, the fourth cave we explored is very close to Banilad, right in the middle of nowhere. Following a small path through the brushes, we arrived at the entrance. Inside, there are a big variety of geological formations dominated by stalactites and stalagmites. We found small pools of crystal clear water here and there and perhaps an underwater tunnel, which appeared constricted. We put this one on our “to-explore-further” list. The last cave for the day was the Convento. This is a trio of three different entrances. The caves again present a fascinating variety of geological formations dominated by stalactites and stalagmites. Only one has a pool of crystal clear water at the bottom. A tunnel was explored but this leads to a constriction after a few meters – another one for the “to-explore-further” list. No significant underwater cave found, but what an exciting day! We thank Col. Bernido, our local host, and his associates for this – and Mr. Guido Valleser for introducing us to the Col.
Canawa spring is up in the mountains of the municipality of Candijay. This is a relatively big pool of water surrounded in three-fourths (3/4) of its circumference, in a horseshoe manner by a high steep slope that seems to funnel down into the spring. This explains the poor visibility of the area, what with all the rains of the last few days carrying soil and silt into the pond. 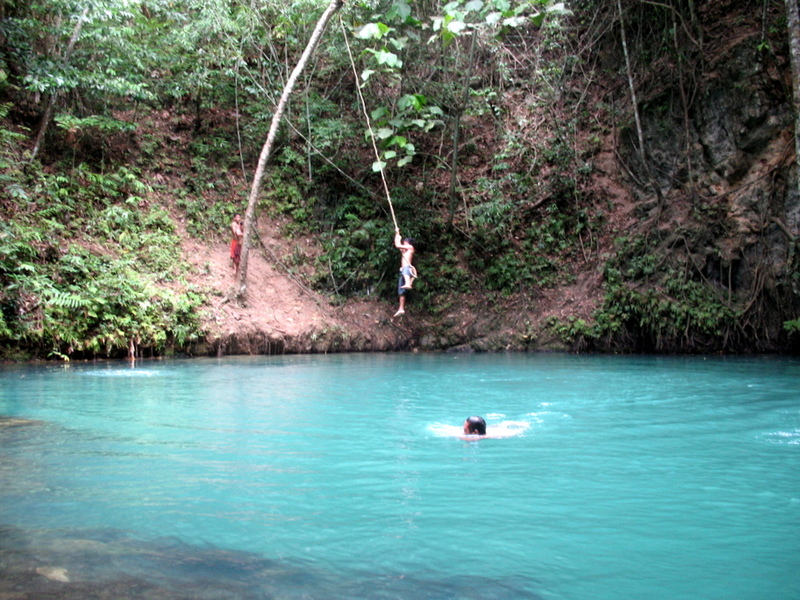 The locals swear to the fact that during the months of January to May, the water is crystal clear. They further told us the story of how someone sounded this area and the weight still did not touch bottom after 50 fathoms. In the murk, we registered a maximum depth of 15 meters after about three bounces. This was a truly unique dive, as we have to negotiate a jumble of downed logs every turn we made it seems. Because of the long slow drive up the mountains to Canawa and the 90-km trip back to Tagbilaran, this was the only spring we did for the day. Definitely, Canawa is another one for the “to-explore-further” list. We met the day with much anticipation as we planned to spend the whole day in Antequera. 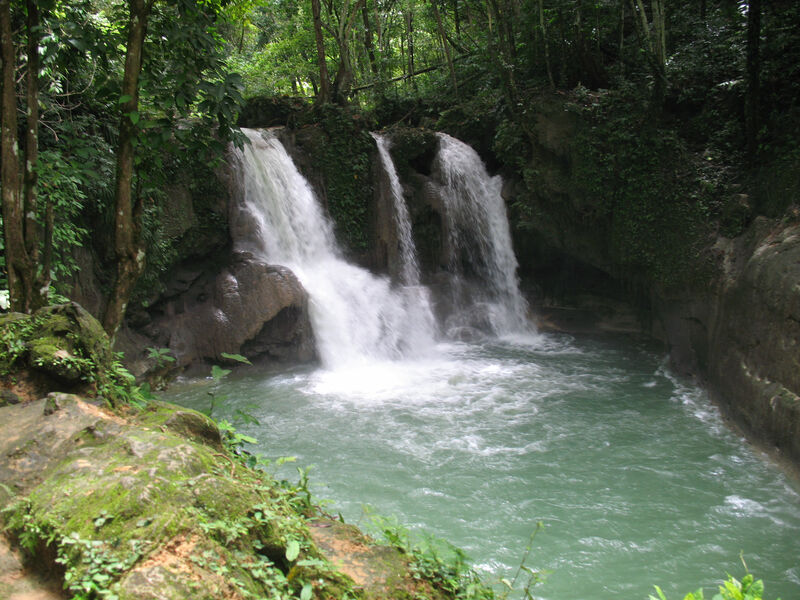 Report has it that this town in the foothills of Bohol Island is studded with caves and springs. Antequera was my original interest to come to Bohol when I met the mayor’s wife in Mactan more than three years ago. She told stories about rivers, water falls, caves and springs. With this embarrassing start, this memorable day (in terms of discovery) started with her calling all available resources to have an informal conference with us in the town plaza while we were having breakfast of sardines and tuna-flavored spread sandwiched in “Amerkambred”. The Inambacan Falls was our first destination. The experience in this area started to shape our day like a tourism rather than an exploratory trip. We explored a small cave wading in against a strong current up to hip high in clear water. This was a very interesting experience of amateur spelunking cut short by fear of bats. No underwater cave here, but what a place! Next tourism stop was the Mag-aso Falls. Like the tourists that we were already, we took a swim up to the main falls area. Much like the locals, we thoroughly enjoyed the cool and refreshing waters. But, with wet suits and hoods on?! On the ride to the next site, Bernil and I discussed our slim chances of finding an underwater cave of significant penetration on this trip. 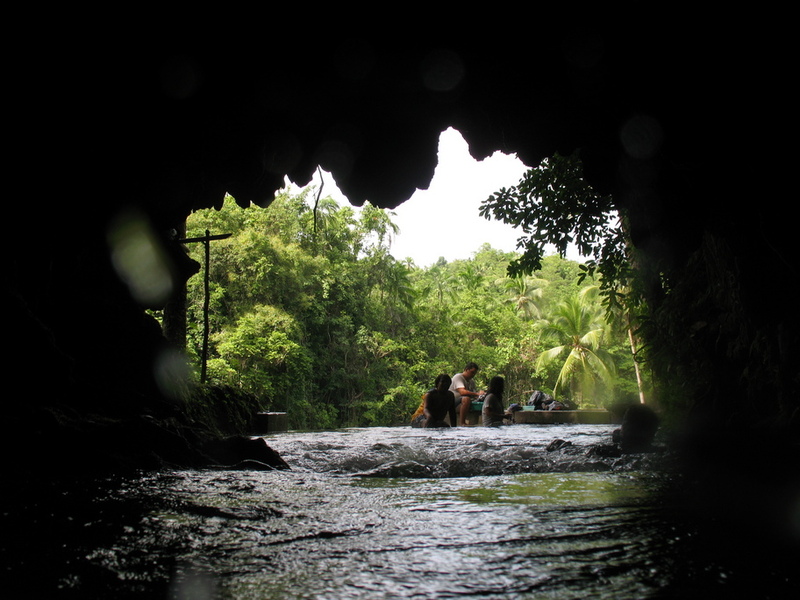 Very shortly, we arrived at Dahonog Cave in Barangay (Village) Tabu-an. 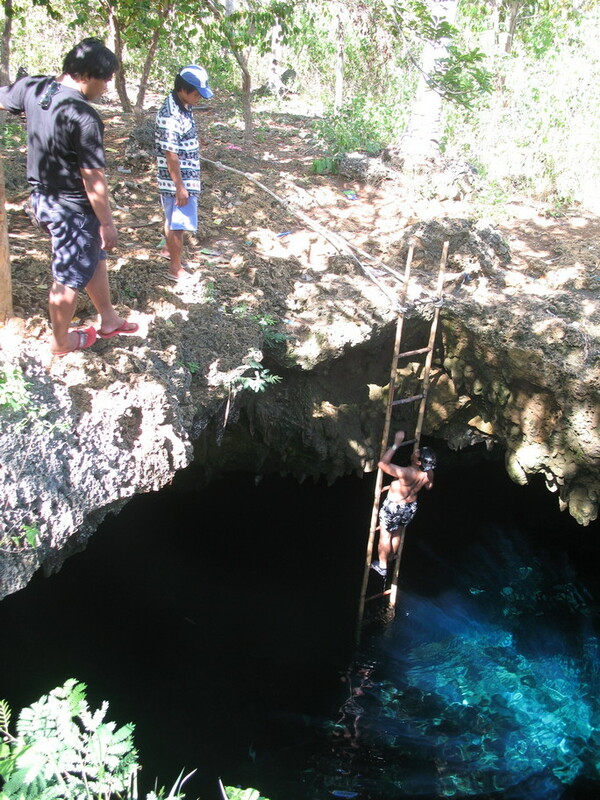 Another steep walk down improvised steps, we arrived at yet another cave with cool waters rushing out. Not minding the small headspace, we went under 2 meters of water to a pool area about 5 meters away. The cave space expanded considerably. We decided to split up and explore the walls from both sides. I took the right side. Less than half the circumference around, I dropped into what seemed like a void in the poor-visibility environment. We had a surface conference and we planned to descend to 2 meters, follow and keep the wall to the right until we dropped into the cave. And what a cave this can be! Under the difficult circumstances visibility-wise, we religiously kept our positions. About 5 minutes into the dive, and not having reached the end of the cave, I decided to call the dive off. As a tribute to how much we stuck to the dive plan under the difficult circumstances, we had an orderly and uneventful exit. We will be back for a full exploration early in the dry season (January/February) when the water clears. As we were doing the post-dive briefing somebody came and told us that there is another hole a stone’s throw away. Going through the bushes, we found a nice pool. After a challenging climb down carved steps, we hit the cool waters. We split up and took opposite sides of the circumference on a surface (mask and lights) look-see. I ran into cool water coming from under an overhang along a wide segment of the rim. I checked this out on one breath – another cave! We went in on a two-man configuration with Bernil taking reel man position. After about 8 minutes, we exited – another cave with extensive possibilities. It does look like we will be coming back to Antequera on a regular basis starting at the front end of the next dry season (January). I had a text-conference with Mayor Cecil. As much as we are, she is looking forward to the coming dry season. 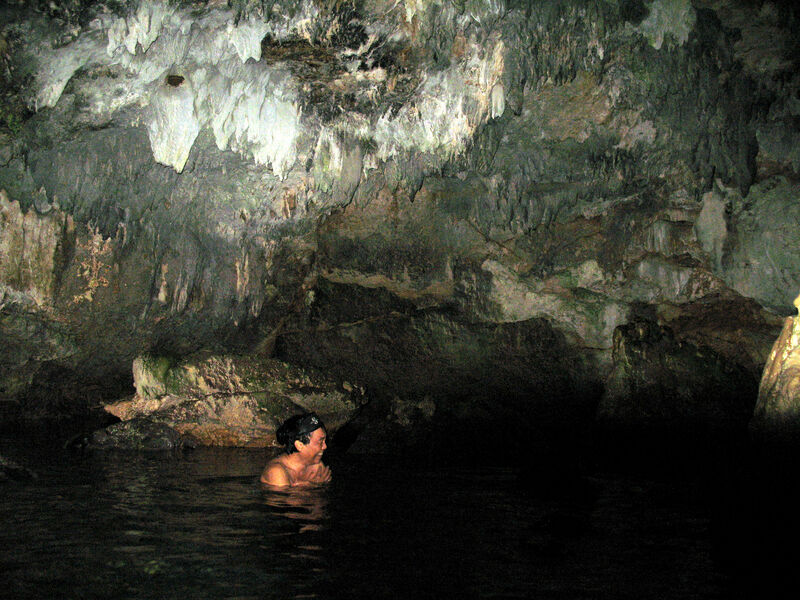 A cenote, in the language of the Indian natives of America, translates as the underworld’s window to the outside world. In the language of the world’s community of cave divers, it means entrance to the unparalleled underwater world of Yucatan, swimming around preserved stalactites and stalagmites. To date, these are the only known geological formations in the world that the term “cenote” is attached to. Philippine culture is such that Filipinos in these contemporary times believe more in the existence of otherworldly beings than the native Indians of Mexico do. Unnatural beings populate the caves, both dry and underwater. So too, the trees surrounding the sinkholes and springs. The common practice is to ask permission from the resident beings when one enters the cave (a simple “Excuse me” will do). 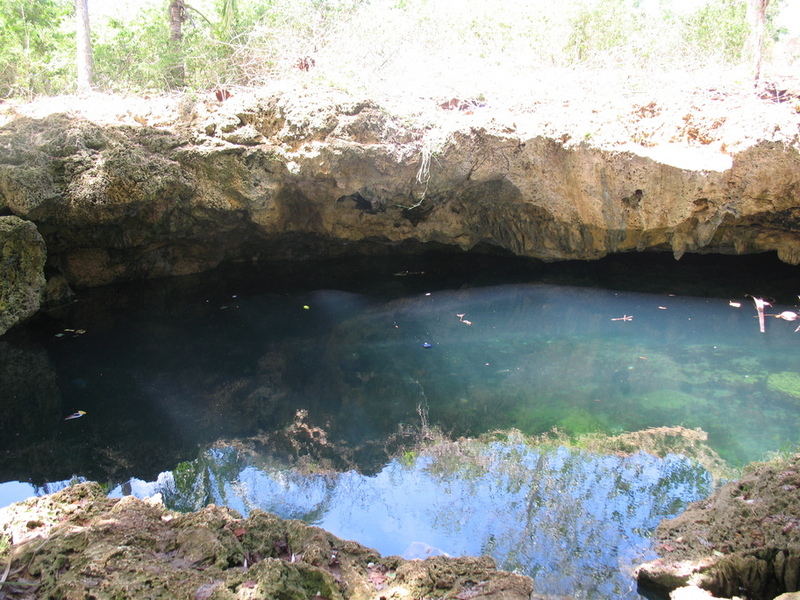 Henceforth, we will refer these karst formations as the Bohol cenotes. 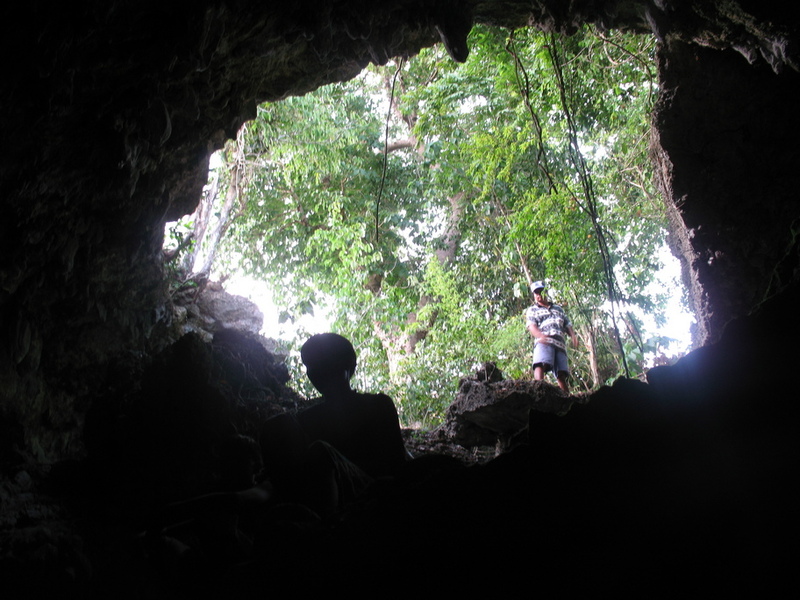 The Bohol cenotes present an interesting view of the outside world when one comes out of a cave dive. One has to come and experience this “unnatural being’s eye view” of the outside world. Cave diving is extreme diving in its truest sense. A claustrophobic underwater environment, strict training requirements and logistical necessities make cave diving an adventure of a relative few – it is estimated that only 1% of scuba divers are or want to be cave divers. 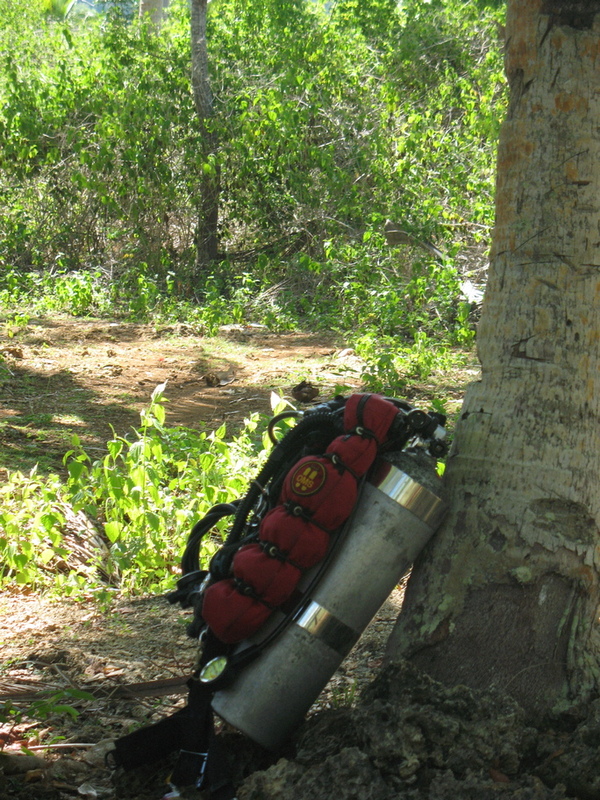 A typical complete cave gear includes twin big-volume tanks joined as one by a manifold connector, appropriate “wings” (buoyancy control device to match the heavy gear), independent primary and secondary regulators with DIN valves, primary light that is as powerful as a car headlight, two backup lights, and a set of guide reels. Additionally, logistical support requirements involving these complicated systems make cave diving trip relatively expensive. Our trip cost us more than Php40,000 over four days on transportation, food and lodging (cheap hotels). Northern Florida in the USA remains the mecca for cave diving and cave diving certification. When I took my cave certification, I remember a small sign that hangs on the lobby entrance of the small motel in the town of Bransford that says “Under this sign pass all the future cave divers of the world”. 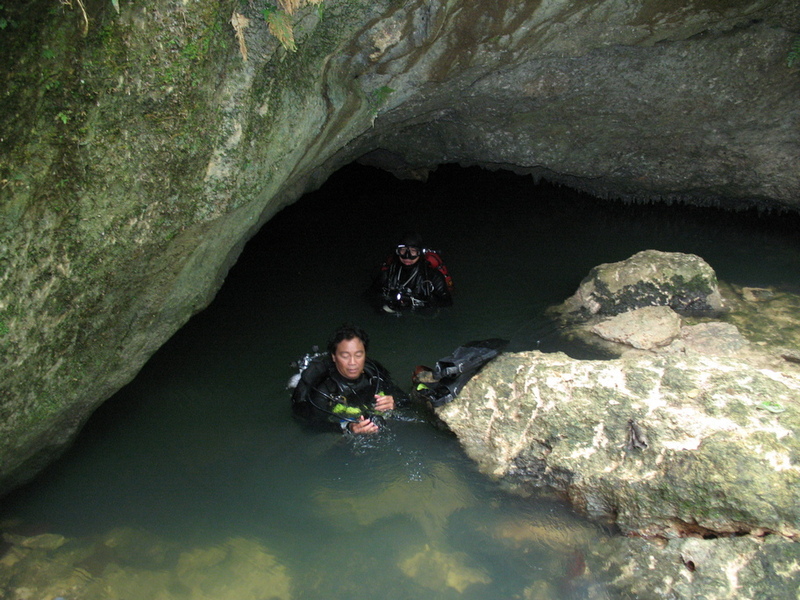 Cave diving started in these parts of the world in the 70’s. To date, there have been more than 475 deaths in the Florida caves. Most all were caused by lack of proper training. 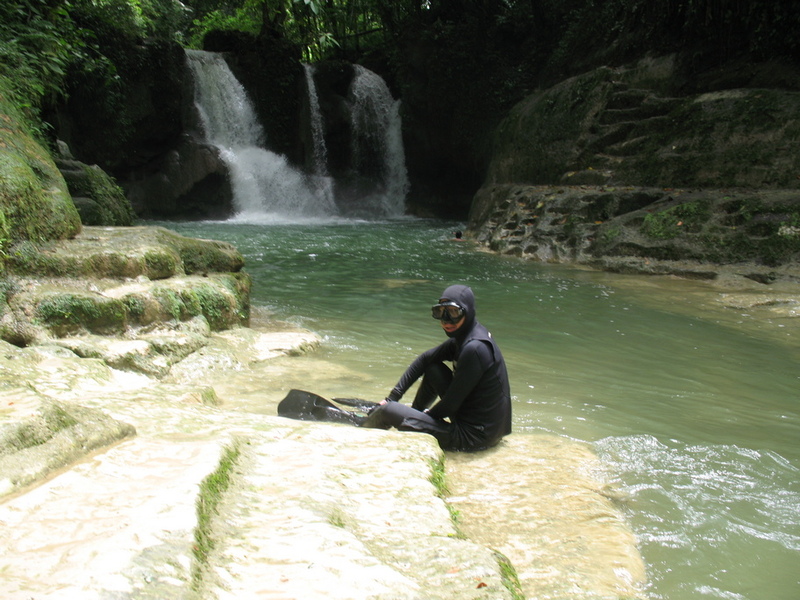 At the outset, we espouse safety in cave diving here in the Visayas region. One must not attempt to enter the underwater cave environment unless properly trained.